While baking these I might’ve been looking up 90’s Mariah Carey to blare. Sometimes you just need to sing along to Fantasy or Always Be My Baby while baking cookies, ya know? I hope you like these so much you get mad at them. I hope you have good intentions (like I did) to just half a cookie at a time… and save the rest for the next day, but instead eat it out of necessity on your couch. What can I say? I’m awful at stopping mid-cookie. There’s so much chocolate in these quarter pounders that you have to knead the dough. It’d be a shame for just one chip not to make it into the end result. So knead it! Casually! Like, twice! And the bake them by the handful. Preheat your oven to 350°F. Line baking sheets with parchment paper. Using an electric mixer combine the butter and sugar. Beat on medium-high speed until light and fluffy, about 2-3 minutes. Blend in the eggs one at a time, scraping down the bowl as needed. Mix in cocoa powder. Add the flour, salt, and baking powder until just incorporated. 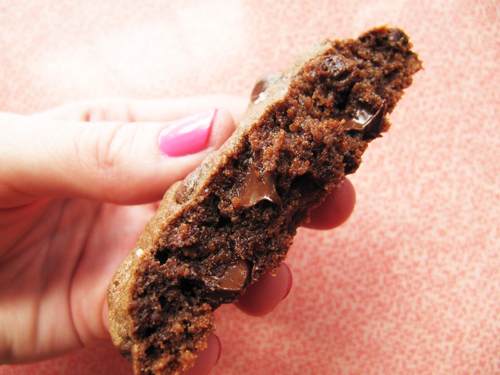 Fold in the chocolate chunks/chips with a spatula until chocolate is evenly dispersed. 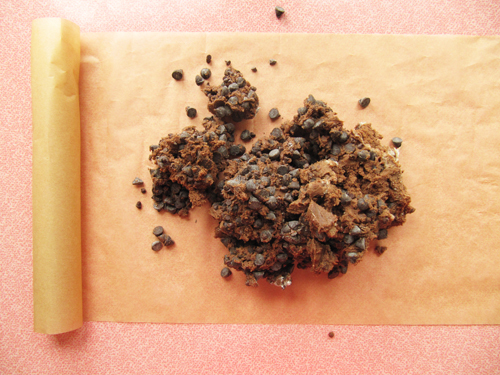 Pour dough onto a parchment covered surface and knead just until all of the chocolate chips are mixed in. Divide dough into 4 oz. portions (or divide into 12 equal pieces). Roll each dough into a ball and flatten just slightly into a disc. Sprinkle with a pinch of sea salt and place on the prepared baking sheets, a few inches apart. Bake 16-20 minutes. Let cool on the baking sheets for 5-10 minutes, then cool completely on a wire rack. Serve with milk for chugging. 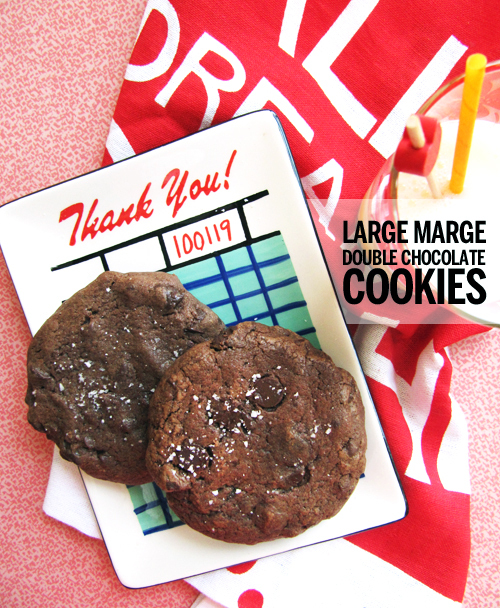 Perfect for sharing, but there’s no shame in being a cookie champ. 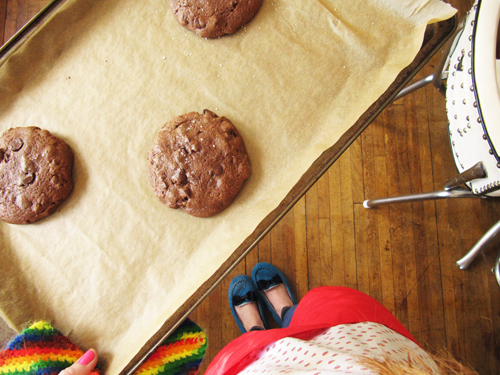 these cookies are like Dream Lover’s…how could you just have half?! For realz. They got the best of me! These cookies are looking goood! I have to make these this weekend.. Thanks Kayla! You probably really should! ’emotions’ always reminds me of summer…that’s some super early 90s mariah! i’m totes making a summer mariah playlist tonight. The cookies look great. And that plate is amazing. Great find. Me too gurl! And yes! haha! These cookies look like a party – can’t wait to eat them! These look oh so great! I’m adding them to my “Things I need to Bake and Eat” list. I’ve been reading your blog for the past few months and I love it! You’re posts are always such a treat (pun whole-heartedly intended). Thanks for sharing the recipes! Keep baking! I found your blog a while ago via the cross-stitch cookies you did for DesignSponge. I’ve made 4 recipes off your site in the last week… I’m a girl with a never ending appetite for chocolate. These babies are DELISH. I could just eat the dough with a spoon. In fact, I kind of did while half were in the oven. Awesome, Kyle! This makes me so happy!